Pelayo Diaz is best known in the blogosphere as the face behind KateLovesMe, a styleblog he started in 2007 when he attended Central Saint Martins. Now, 2 years after graduation, Pelayo, who is considered to be one of the pioneering bloggers of his time, has grown from street-style icon to successfully launching a multifaceted career that includes collaborations with Canon, Prada and Louis Vuitton. The ever-charming and always well-humoured Spaniard shares with us, life after London as he settles back in Madrid and begins a new role at the helm of luxury label Davidelfin. MYKRO: Over the last couple of years you have been living in London but where did you grow up? PELAYO: I was raised in Oviedo, a small town north of Spain where I lived with my parents and sister. I went to a nun school for 13 years and it was absolute hell. All I remember about that time is constantly hearing: Don’t touch that. Stop it. Don’t eat that. In hindsight, it might actually be one of the reasons why I went into fashion in the first place, what with all the berating rules and regulations I had to endure. That all changed when I started attending art school in a nearby town. I finally had a feeling of fitting in, of belonging somewhere and to be able to share the same kinds of passions and similar interests with likeminded people. It provided me with a much needed outlet. MYKRO: How did you get involved in fashion? PELAYO: Well, after I’d finished art school, everyone else went off to university and I felt a bit like a lost soul, so I moved to Barcelona, where I worked as a sales assistant at Carolina Herrera’s bags department. It wasn’t until they offered me another position that I decided to study abroad and move to London to apply for Central Saint Martins. Which I sort of have my sister to thank for in the end, because she ended up convincing my parents it was a good idea. The day I got accepted, I had her name tattooed on my arm. MYKRO: So you have a close relationship with your family? PELAYO: Absolutely, we’ve always been quite a tight knit family, though I’ve come to terms with the fact I like them even better long distance [laughs]. I just had my parents over for the weekend and couldn’t really get over the fact how incredibly Spanish they were, which basically boils down to talking way too loud at all times. You see, my family has a way of speaking to each other which is often mistaken for verbal abuse. When in fact they’re actually saying something sweet or affectionate. I’m especially close to my sister, always have been, but our bond seems to have gotten even stronger since she had her first child. MYKRO: How does it feel to be an uncle? PELAYO: You know what? I can’t even begin to express the love I feel for that little bundle of joy and my sister, for that matter. I’ve never really been into having kids but this experience had me reevaluate my priorities and made me realize I do want to have children in the future. It has definitely brought out some paternal instincts I didn’t know I had in me. As soon as I found out she was pregnant with Nicolás, I made an appointment to secretly get his name tattooed. MYKRO: Who knew you’d be such a hopeless romantic? PELAYO: [laughs] I am! In fact, I just moved back to Madrid to be with my boyfriend. If you’re going to move countries, the best reason to do so is for love, right? MYKRO: Absolutely. How do you balance your chaotic work schedule with that need for a more quiet lifestyle? PELAYO: Ever since moving to Madrid, I’ve come to appreciate this homely state more and more. Don’t get me wrong, it will never compare to lively London, but sometimes it almost feels like I was living a dream out there, you know what I mean? I was living the proper student life, had no care in the world and my parents financially took care of me. Here, in Madrid, I’m leading somewhat of a steady life, being economically independent and able to take care of myself. MYKRO: So for the record, you’re not joking when you say you’d like to settle down and, at one point, have a baby and maybe even a dog, to complete the picture? PELAYO: I’d love to get a dog! But it wouldn’t really be fair, me being away half the time. I used to have one but I had to leave it behind when I moved to London. My dad loved that dog to bits so when it died, I got him a new one from the same race. In a way, it’s almost as if he thinks the dog’s immortal now. But to answer your question, yes, I’d love to. MYKRO: You travel a lot, do you mind being so transient? PELAYO: Not really. It’s why I got this tattoo ‘You’re nowhere’. ‘Nowhere’ has a lot of different meanings to me. It’s a reminder of being ‘nowhere’ in comparison to my dreams, to keep striving, but it also means home. Like, you can be ‘nowhere’ and be at home at the same time. Does that make sense? MYKRO: Totally. What is your most recent tattoo? 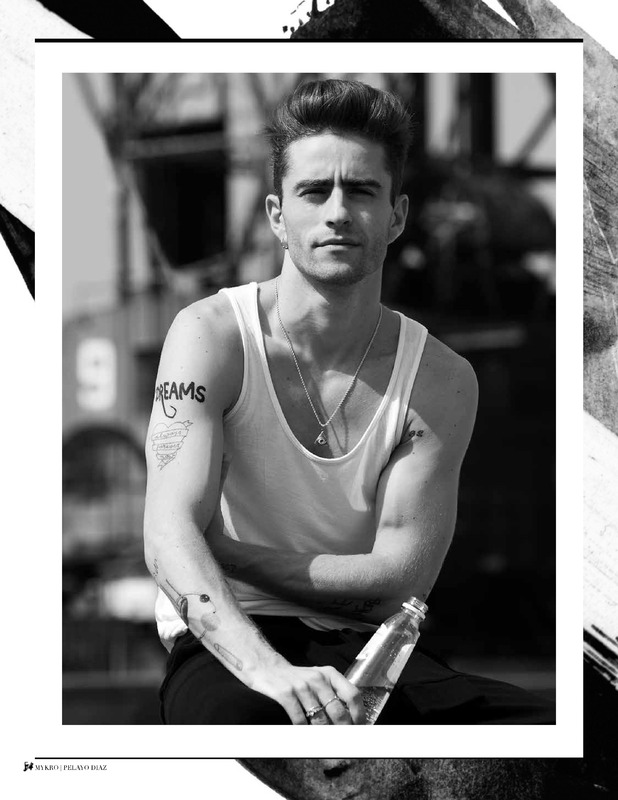 PELAYO: I had a couple of them done at the same time, including this one on my upper arm that says ‘dreams’. I think it’s important to dream big and strive for what you believe in but I was also inspired by a sketch I saw in a book about Jack Pierson, an artist whose work I admire. None of my tattoos have really been preplanned and I like that the idea of jutting something down on a paper has that same impulsive quality to it. MYKRO: I would love to talk about some of the projects you’ve worked on. You’ve collaborated with the biggest names out there. How has your experience been? PELAYO: I’ve indeed been lucky enough to collaborate with a number of people and brands I admire and look up to and it’s not something I take for granted. The surprising thing is, contrary to what many may believe, is that small companies often demand a lot more from you. Big brands are able to provide you with endless possibilities and unlimited access, something which is a lot less likely to occur working with a smaller label. MYKRO: In terms of collaborating with other people, is there anyone on your wish list? PELAYO: I must say I really enjoy working with David Delfin but if I could choose anyone, it would have to be either Nicolas Ghesquière or Ricardo Tisci. They’re my favorites by far. MYKRO: What are you currently working on? PELAYO: Right now, I’m working on a range of footwear for Soulstruck. The collection will comprise of three different designs, closely linked to my personal style. All I know so far, is that I want something different, something that isn’t already out there. Guys still really don’t have much options these days and so I want to cater to those special needs, creating something with attention to detail. This isn’t some big money deal, I’m really hands on and excited about it. I’ll definitely be wearing them and feature them on my blog. MYKRO: Speaking of your blog, you design, you’re a creative and the occasional DJ. Do you consider your blog to be your first priority? PELAYO: Yes, though I must say it has always felt more like a hobby to me. And despite not being a student anymore, I feel it still captures that essence I started out with. I want my blog to inspire people and my designs to make people dream. MYKRO: If you could host a dinner party and invite anyone, dead or alive, who would it be? PELAYO: Isabella Blow! She’s always served as one of my biggest inspirations and I had dreamed of her attending my graduation show from Central Saint Martins, as she had a tendency of doing so in the past. Unfortunately, she passed when I was in my first year. MYKRO: What do you consider to be your strength? PELAYO: I like to believe I’m optimistic and have a positive outlook on life, which carries a long way. At the end of the day, I want to have fun. And so when they ask me come and DJ, I don’t do it because I think I’m the world’s best DJ, on the contrary, but as long as I’m able project my energy and enthusiasm and everyone else is having a blast, then my mission’s complete. MYKRO: So, what’s next for you? PELAYO: I honestly have no idea. Like, I could be saying to you right now I have nothing planned this week and the next minute, open an email to find out I’m flying to Paris the next day. That’s basically what my life looks like and also the best part of my job. I’m continuously looking for new impulses and my job allows me to constantly meet new people and to re-invent myself on a daily base and I love it. In fact, I think I need it. After all, boredom is the death of all creativity.